You don’t have to sit for hours in equipoise meditation before you become a Yogi. No, the path of Kama Yoga is one of action. Of course, not just any old actions will do; they must be actions born from good intention and benefit others. The great news is anyone can do this. It requires neither flexibility nor lungs like bellows. In fact all you need is a big heart! It would matter not even if your heart had a slight defect. Why, because intention is not a physical act it is a psycho-emotional one, even a person with a heart problem can give generous amounts of love. I recently had the pleasure of meeting such a man. David Calvert Orange is a Yogi, without ever having practiced yoga in the conventional sense. He is a retired school master who was forced to leave work early, due to a heart defect. Since then, all he has done is unconditionally give to others. 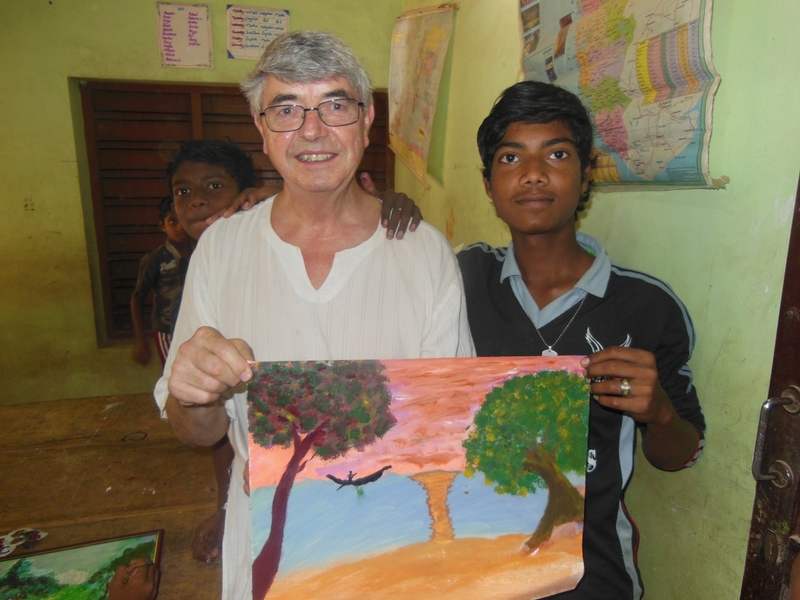 The ripples of his work have changed the lives of hundreds of poverty stricken families in South India. Supposing you won the lottery tomorrow, what would you do with all that lolly? David told me he would spend it on his charity ‘The Wheel of Hope’ which feeds and educates more than 150 deprived children on a daily basis. He expressed his urgency to win the lottery so the charity could purchase a building instead of renting. David is one of a small group of individuals who run the charity, appropriately named the ‘Happy Home’. David, Pamela and Suresh alongside a board or trustees selflessly give their time to raise funds to keep Happy Home operational. The school provides valuable life skills and tuition to youngsters from poor fishing families, who would otherwise fall slaves to the slums in which they live. But the charities work delves much deeper than child education. Due to most children coming from broken and abusive homes, Wheel of Hope also provides counselling for mothers to help ease welfare issues in the home. As a result, the project has a profound impact on the whole community. However, the work is relentless and due to increasing property prices the charity is under threat unless it secures a building of its own. Whether you buy from your local Oxfam or donate to a chosen charity, you will know that supporting a good cause is as rewarding for the giver as it is the receiver. But just how much of your cash do the beneficiaries actually receive? Some large organisations have so many overheads and salaries to pay that it is hard to locate where exactly our donations go. Aside from these large organisations, which without doubt do great work, there are those fighting poverty on the front line, individuals and small charities that give from hand to mouth. Wheel of Hope is one of these. Sadly the charity relies on fund raising from people such as you and me. However, this could all change with one final push. This latest campaign, to buy a property, will ensure long term sustainability. Without such facilities, the project will inevitably rely on fundraising activities, the likes of which David’s team will not be able to sustain forever. After seeing his work, my own lottery wish is to see that Wheel of Hope does not vanish without leaving a legacy. If David’s story inspires you, as it did me, and you would like to help, you can get involved in a number of ways. See the website http://www.wheelofhope.co.uk for more details. This entry was posted in I had to write about it on May 21, 2014 by Glen Monks.